After an easy drive to Donnelly and over No Business Summit (pass), we found the road that we believed to be the way to the trailhead. It had a sign posted "No Motor Vehicles" but the sign appeared to be intended for ATVers, as the road was somewhat well-traveled. So we drove about 200 yards, where we were stopped by a gate. This was about a mile short of where the map showed a trail, but the gate DID have a sign saying something to the effect of "Welcome Hikers." Not something you would normally find on the Payette National Forest! So we started walking down the old road, which showed little evidence of recent use other than lots of deer prints. We wandered around straining our eyes for what we expected to be a long-abandoned trail, when we came across this Trail sign. Improvements! Complete with arrow. I speculate, based on lots of hiking in the area on abandoned and non-maintained trails, that the Payette spent their entire trail budget on just this one trail-- because it's really a great trail and seemingly well taken care of. Granted, there is some brush on the sides of the path, but if you keep your eyes open it's really very easy to follow (with one or two exceptions caused by the wholesale moving of the trail, or by alternate cow paths in the upper meadowy areas). Over the course from car to summit, there were only about 10 trees down. 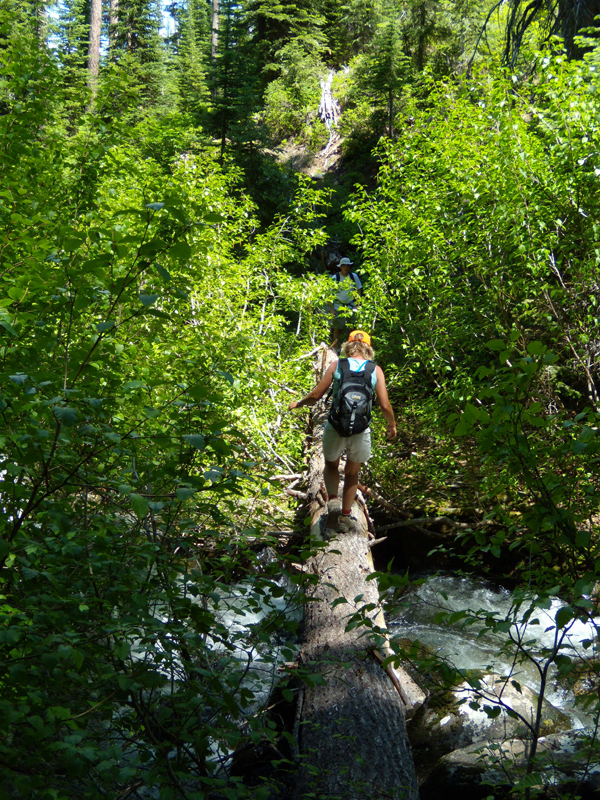 And at the one real creek crossing, there was a big tree across the creek no more than 30 feet from the trail. Here's a good example of the tread as the timber and huckleberry bushes started to thin out up high. 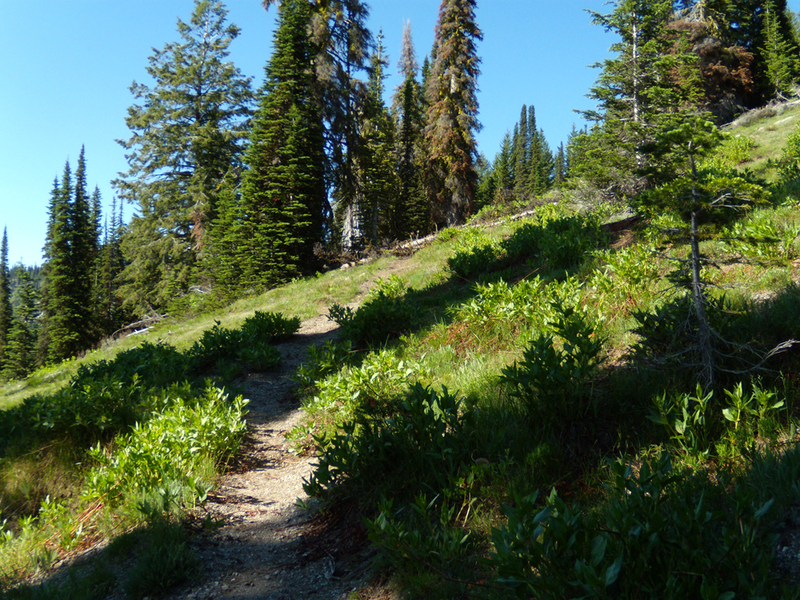 The trail winds through timber and eventually gains a ridge. As you gradually climb the ridge, you can see north, including the Seven Devils and the Wallowas (snowy!). To the south, you look into Granite Basin, which is bordered by two peaks. This pointy thing is Point 7859. And this is Council Mountain. Did I mention there were tons of wildflowers? Super Dave and Julie were uncharacteristically slow because they had to stop and identify every single one (sound of foot tapping while I wait). 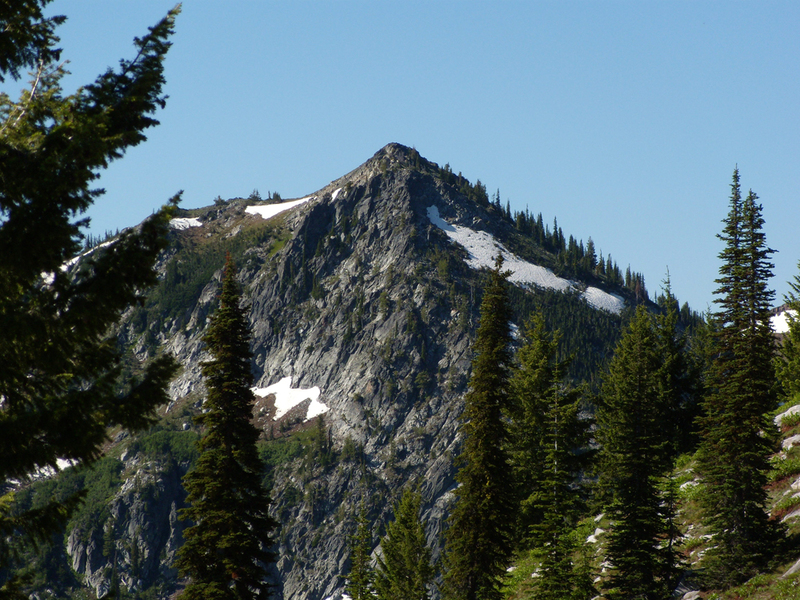 The western border of Granite Basin is a high ridge, again with a great trail. As you crusie the trail across the ridge, you can look down into Council with Indian Valley and Cambridge just a bit further off. 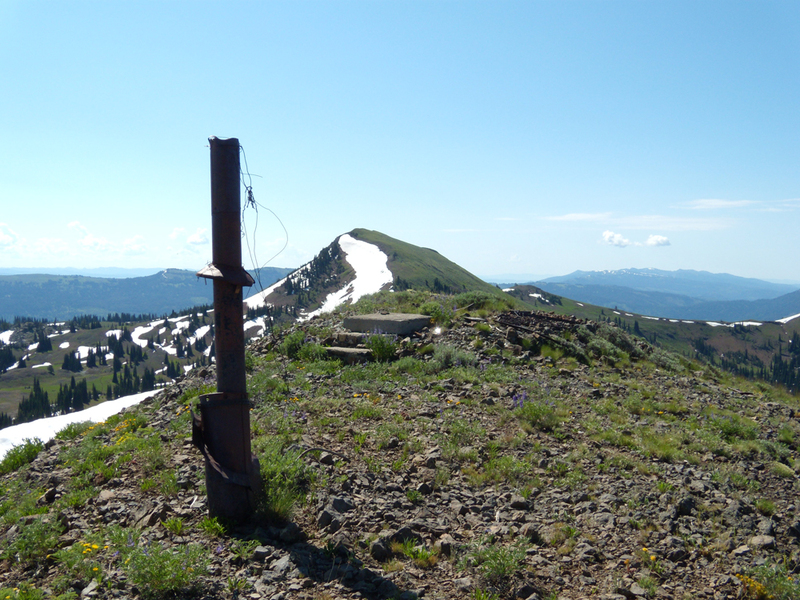 The picture shows Council Mountain in the background, and the ruins of an old lookout up front. 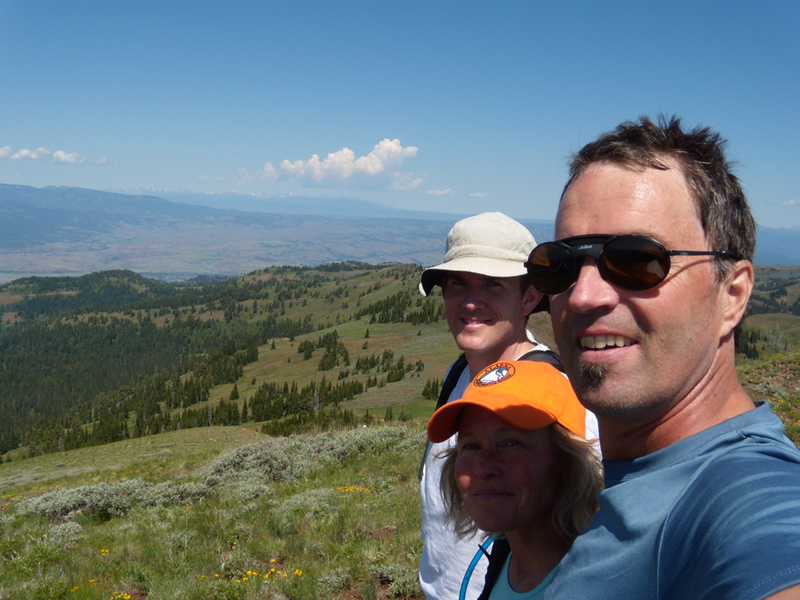 Even with all the plant ID'ing, we still made the summit in four hours. There were a few thunderheads developing here and there over the mountains, but for the most part it was sunny. Even hot. 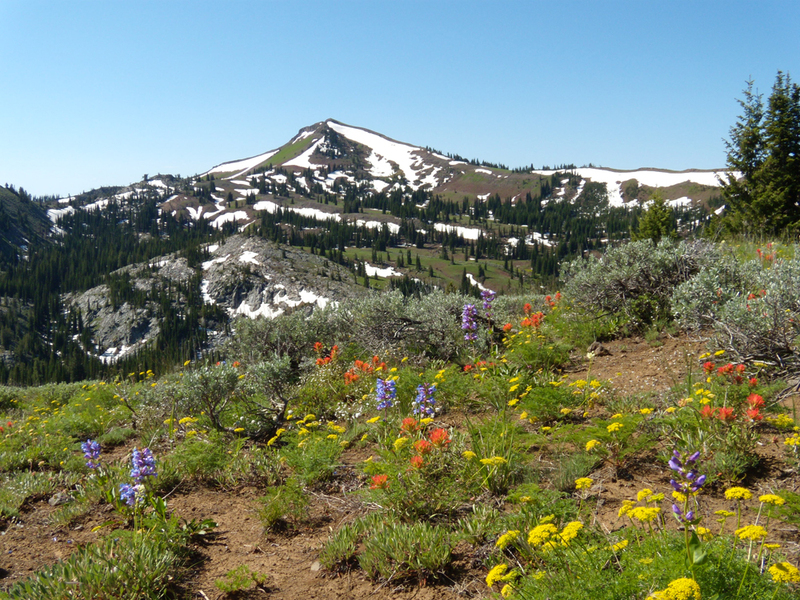 We had a leisurely lunch on the summit admiring the wildflowers (even on the summit!). The panorama below shows the ridge that borders the northern side of Granite Basin (the closer one). If you click for the bigger version and look hard, you can see parts of the trail. You can also see both the Wallowas and the Seven Devils. After our lunch, Super Dave and I ran up Point 7859, where I took this shot of No Business Lookout. You can see the clouds building. In the bigger version you can see Nick Peak off in the distance, to the left of the lookout. This map shows our climbing route. You might want the National Forest map to find the right roads to drive on (and also refer to Lopez's book). The roads are in good shape, and easily driven in any car. The trail appeared to be pretty much unused, except it was in great shape. Until we got on top, we saw no human footprints. On our return, we followed the trail from the saddle between Council and 7859. This is a real trail, but it contained a bit of snow and a lot of wet soil. Still, it created both a loop and somewhat of a shortcut. Super Dave needed to get home on time, so we beat feet on our return so made it back to the car at a little after 3pm. Note: The map does not show that the (new) trail crosses (older) logging roads multiple times down low. 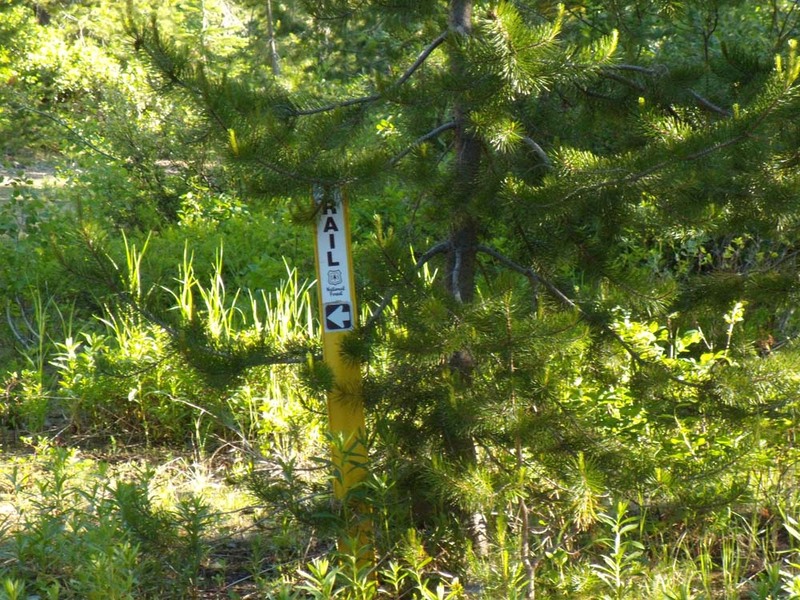 But each road crossing was obvious and easy to stay on the trail.